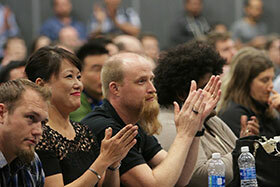 Ignite OSCON is back and will be held Tuesday evening, July 17, following the day’s tutorials. Join us for a fun, high-energy evening of speed talks—all aspiring to live up to the Ignite motto: Enlighten us, but make it quick. 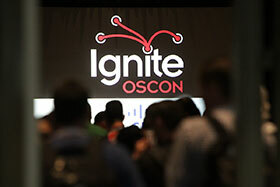 Ignite is free and open to the public. Danese talks about her offsite at Clown Camp. Russ tells us about how he runs his life. Burnout is real, and it is running rampant throughout the community industry. You’re here to serve, and you want to be available, but the reality is you can’t be there for your community if you aren’t taking care of yourself. Sherrie explains how to avoid burnout in your work so you can be the best you for your community. Bad UIs. . .They’re everywhere! Mike leads a raucous and rollicking view of user interfaces—not only in software but throughout society. You’ll hear about the funniest (and sometimes frightening) bits that he has seen in his research on user interface text. Watch as two speakers present a single Ignite talk in the form of the world’s worst tech interview. Adam is on his third stint as a remote worker, and like Goldilocks, he’s finding that the third time is the charm. Adam dissects the good, the bad, and the ugly about remote work: the happy times, the tears, and the many things, both large and small, employers and employees alike can do to make remote work as smooth as working in an office. Paris and his partner have each lost 60 kgs (130 lbs) over the last two years. Paris shares the realities of losing that much weight (physical, mental, and so on) and leads an entertaining journey through the ways things have changed as they’ve lost weight, how people have treated them, and the different ways people’s comments, and their own progress, have made us feel. Everybody has heard the phrase, “If you build, it they will come.” That’s simply not true for open source projects, where there are many similar projects to choose from. Renisha explains how a PR campaign can help your project stand out from the crowd by increasing project recognition, controlling the flow of information presented, and driving specific actions.